We caught an episode of Cook's Country on TV one day, the theme being "Midwestern Favorites." Frankly, I had no idea what Midwestern Favorites could be, so I was very curious. Bridget and "Bow-Tie" (their nickname for Christopher Kimball) first made Chicago-style Ribs. That was very intriguing as I didn't know such an entity existed! Afterwards, Julia and Bow-Tie made Cincinnati-style Chili. I remembered that I do know about Cincinnati-style Chili, seeing some show or another featuring the dish on the Food Network years ago. It looked so good! We saved the show on our PVR and then, finally, a couple of weeks later, we had the opportunity to make it. I took notes while watching the episode, but I noticed that they would leave out the measurement of a few ingredients. Very crafty indeed. In any case, it was easy enough to guess. I made the sauce: no browning or boiling of the ground beef beforehand, and the only flavorings were oregano, cinnamon and allspice. It was quick, needing only about 15 minutes of simmering. And that was it! Very easy. I have transcribed the recipe below, as it's not available from Cook's Country. 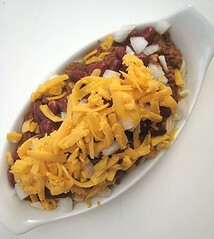 To make this a "five-way", we ate our chili with spaghetti, kidney beans, diced raw onions and cheddar cheese. And, I think it does have to be assembled in that specific order! ...followed by grated cheddar cheese. We used strong cheddar. 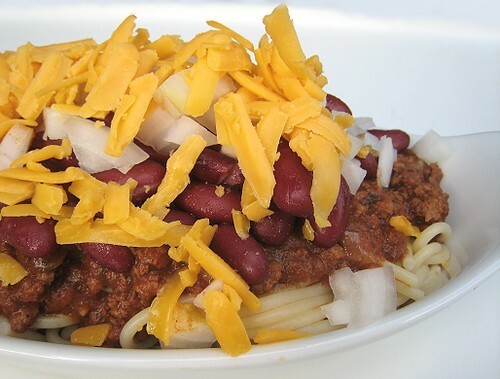 Imagine spaghetti with "sauce" -- already good by itself -- with heartiness added by the kidney beans, a fresh crisp flavor from the onions, then the strong cheddar to add some saltiness. Now, we -- especially our brother, who insists that serving this over spaghetti is "weird" -- are looking forward to topping hotdogs with this chili! Heat some oil in a pot. 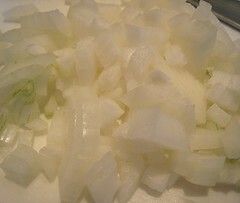 Sauté diced onions until softened and a little brown around the edges. Then, add the garlic, tomato paste, chili powder, oregano, cinnamon, allspice, salt and pepper. Cook for about a minute. Add the tomato sauce, chicken stock, brown sugar and cider vinegar. When the sauce starts to bubble, add the ground beef. Break up the beef into small pieces with a potato masher. When the sauce resumes bubbling/boiling, turn the heat to low and simmer for about 15 minutes, or until the beef is cooked. 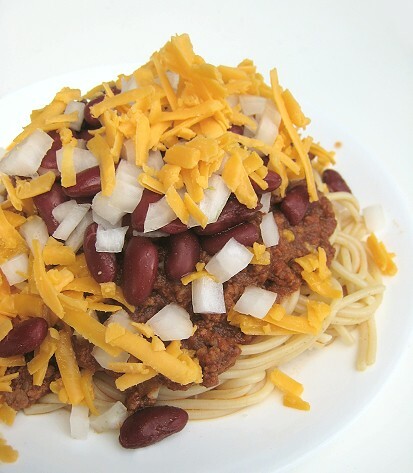 Serve on top of spaghetti, and then, in this order, top with kidney beans, diced onions, and cheese. Enjoy! It does look delicious! Would you believe they sell Cincinnati style chili in a can?! If it's this easy to make, who'd want to bother with a canned version! I went to college in Ohio & there was a Skyway Cincinnati chili place right near campus & I never ever ate it. That is one tasty looking chili! I like all of the beans and cheese on it! I would have never thought to put chili on pasta until I saw it on an episode of No Reservations where Tony went to Cleveland. So inspired. I am going to save this for the winter. The "sauce" was good all by itself, but the beans and that strong cheddar (and the raw onions) really added a lot to the dish! As a lifetime Cincinnati resident, I must encourage further eating of Cincinnati-style chili. I'm also a native Cincinnatian and I find your recipe very interesting. 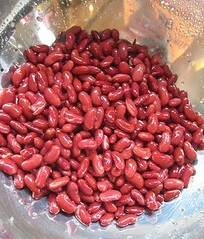 I've never had a three (or 4 or 5) way with all those kidney beans. I don't know if the show you were watching left this out on purpose but I'll let you in on some insider information... the secret ingredient is cocoa. And they not only sell this stuff in cans (which is kinda gross) but you can get packets of Cincinnati Recipe chili mix - basically just seasoning - which makes life super easy. Nothing personal, but that is not Cincinnati-style chili. I grew up in Cincinnati. 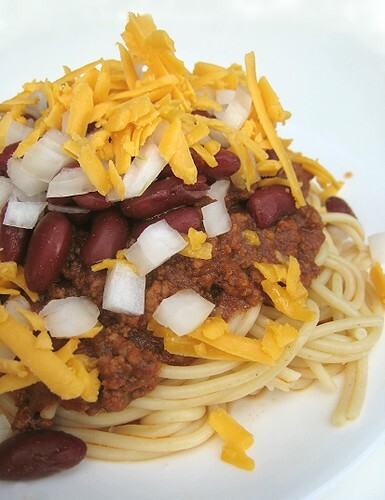 Cincinnati chili starts out with double-ground beef (grind it once using the fine disk. then run it through the grinder again). The beef is boiled first. This breaks the beef up. When the chili is done, it should be have the consistency of a coarsely pureed soup. As far as seasoning goes, you're missing several essential ingredients: bittersweet chocolate, nutmeg and cloves (there's more, but Skyline, Gold Star, et al, all keep their recipes close to their chests). There's no chicken stock in it, either. Jane and Michael Stern's book, _Square_Meals_ has a Cincinnati-style chili recipe that is a close approximation to Skyline chili. Their recipe spices it with, in addition to chili powder, sweet paprika, black pepper, cumin, turmeric, marjoram, allspice, nutmeg, cinnamon, cloves, mace, coriander, cardamom and bay leaf. 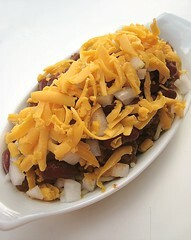 2. chili bean (a bowl of chili with kidney beans on top). 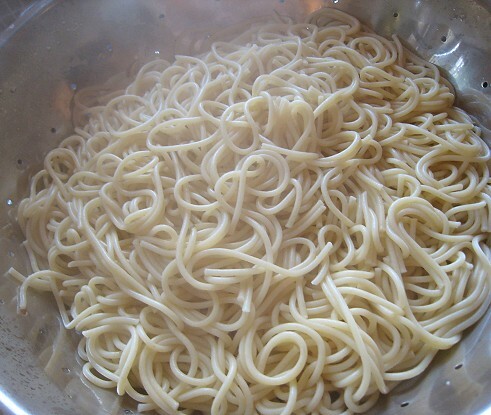 1. chili spaghetti, sometimes called a 2-way. spaghetti, chili. 2. 3-way: spaghetti, chili, cheese. 3. 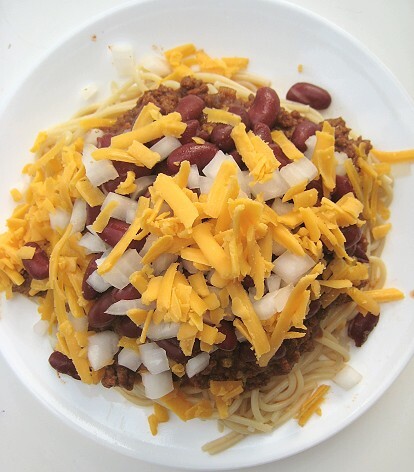 3-way bean: spaghetti, chili, beans, cheese. 4. 4-way: spaghetti, chili, diced onions, cheese. 5. 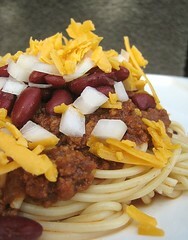 5-way: spaghetti, chili, beans, diced onions, cheese. 1. chili sandwich. This is simply a hot dog bun filled with chili (and hence, not a coney). 2. coney. hot dog bun, hot dog, smear of yellow mustard, chili, onions. 3. coney no onion. 1 coney, hold the onions. 4. cheese coney. take one coney, above, top with cheese. 5. cheese coney no onion. one cheese coney, hold the onion. Ways to order: if what you want are just coneys, you can dispense with the "coney" bit. For instance, if you want 3 cheese coneys and your friend wants two w/o onions, you tell the waitress, "5 cheese, two no onion on two". Note that "cheese" here means finely grated American cheese. It does not mean cheddar of any variety. It does not mean coarsely grated cheese. Also, onions are finely diced white onions. They are rinsed (well) in water. This is a restaurant prep chef trick that allows the onions to keep for 2-3 days in the refrigerator. As a side effect, the onions taste becomes much milder. 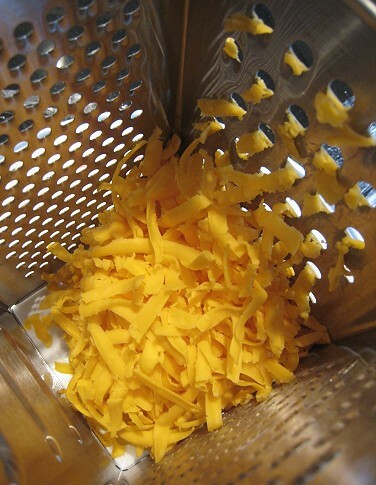 Nice, artistic, unusual photograph of the cheese in the grater!